The HP Photosmart eStation is a photo inkjet printer that includes a number of features otherwise unseen on consumer grade printers, most notably a 7" detachable wireless touchscreen tablet. Users who don't already use a PDA or wireless device may find this extremely worthwhile, and others may be interested in printer technology simply not offered by anyone else. The printer measures 17.83" by 17.9" by 9.5" and weighs 17.42 lbs, making it consistent with most consumer multifunction printers in terms of its general construction and build quality. It will likely fit on a table alongside other equipment without a great deal of inconvenience. The printer produces prints at resolutions of 600 by 600 dpi in black or 9600 by 2400 dpi in color, and at speeds of 33 pages per minute in black and 32 pages per minute in color, as well as color photos in 16 seconds or less. 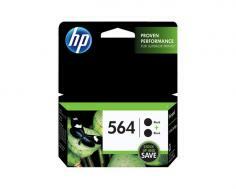 HP does, however, note that this is for draft-quality prints, not maximum. Duplex printing is built in automatically in order to save time, money and paper. The printer supports borderless printing up to 8.5" by 11". It supports printing to plain, inkjet, and photo paper, transparencies, envelopes, labels, and index and greeting cards. It also supports media in its main tray sized Letter, Legal, Executive, 3" by 5", 4" by 6", 5"by 7", 8" by 10", and No. 10 envelopes with custom media sizes of 8 by 13 cm to 22 by 36 cm possible. Its photo tray supports 3.5" by 5", 4" by 6", and 5" by 7" photos as well as custom documents sized between 9 by 13 and 13 by 18 cm. The printer has a 125-sheet input tray and a 20-sheet photo tray, consistent with most models like this one in offering 100-200 sheets of standard printing. A 15-envelope feeder is also included. The built-in scanner works via flatbed. It can produce scans up to 1200 by 2400 dpi and enhanced scans up to 19200 dpi, with support for documents as large as 8.5" by 11.7" and 48-bit, 256-level grayscale. The copier produces copies at 600 dpi (and up to 1200 dpi optimized), as well as up to 99 copies at a time. Documents can be scaled between 25% and 400% if necessary. The printer includes 64 MB of RAM, which cannot be expanded. It connects to systems via USB 2.0 or via 802.11 b/g/n, allowing for wireless connectivity. It also includes support for Secure Digital cards built-in, though many other printers offer more memory card support than this one. 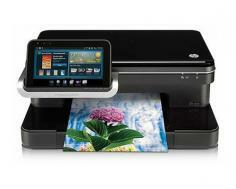 The eStation includes a 7" detachable tablet that interfaces wirelessly with the printer. Unlike other control panels, the tablet runs on Google's Android 2.1 OS and can also be used for web browsing, to read eBooks, and to send documents directly from it to the printer, essentially providing a portable tablet with the printer. It includes support for a number of templates and applications (such as Yahoo and Facebook). More than anything else, this sets the eStation apart, as no other consumer printer at this point offers anything particularly similar to this. The printer includes support for Windows XP (Service Pack 2), Vista and 7 with its included drivers, as well as Mac OS X 10.5 or newer. Users of older Mac systems, especially PowerPC-based Mac users with no desire to upgrade to 10.5, may wish to consider a different printer. The printer lacks an automatic document feeder and automatic paper sensing, making it slightly less convenient than several other consumer multifunction photo printers like this one. Review it: "HP PhotoSmart eStation "
The Photosmart eStation has a 5-ink system with cartridges available in both standard and XL sizes. Inks come in black, photo, cyan, magenta, and yellow. 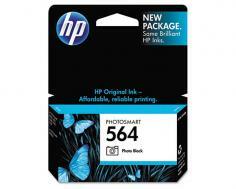 The standard capacity black ink is rated at 250 pages, photo is rated at 130 4" by 6" in photos, while all color cartridges ar rated at 300 pages. The XL versions are rated at 800 pages for black, 290 4" by 6" pages for photos, and 750 pages per color.